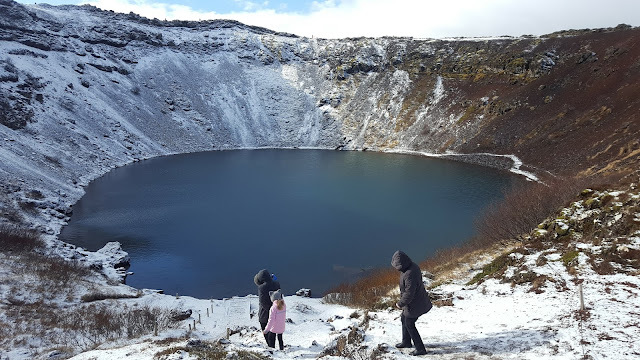 Once prepared for my week in Iceland in terms of clothes, sorting out my car hire, and buying cheap snack bars before I set off, all that was left to do was plan the actual road trip. There are pretty much only two routes you can take, unless you're heading in summer and hiring some form of jeep. The country is surrounded by its main ring road, therefore the two options are to go on the ringroad clockwise, or anti-clockwise. As I only had a week on my trip, we didn't have time to go all the way round the ringroad, therefore the only option was to go so far, and then drive back on ourselves. 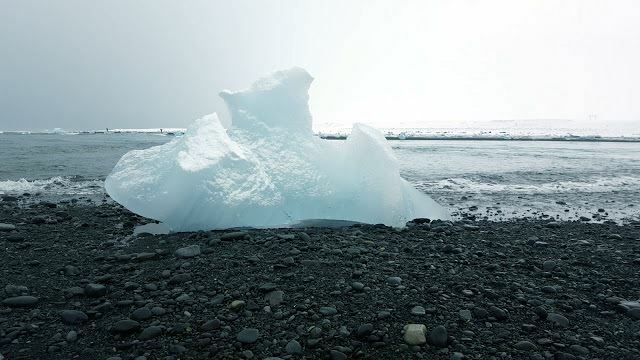 The northern most capital city in the world. But definitely not the most exciting. 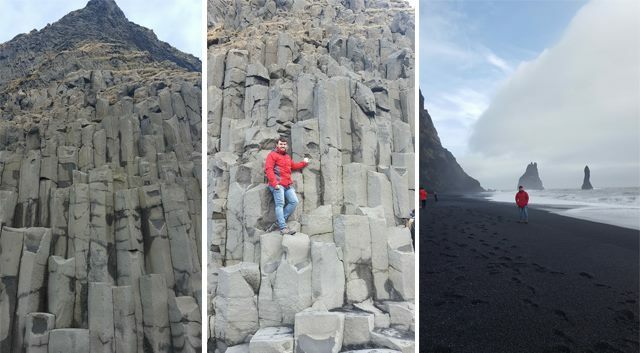 My friend told me that we could cover the Icelandic capital in a day, and we pretty much did it in half. 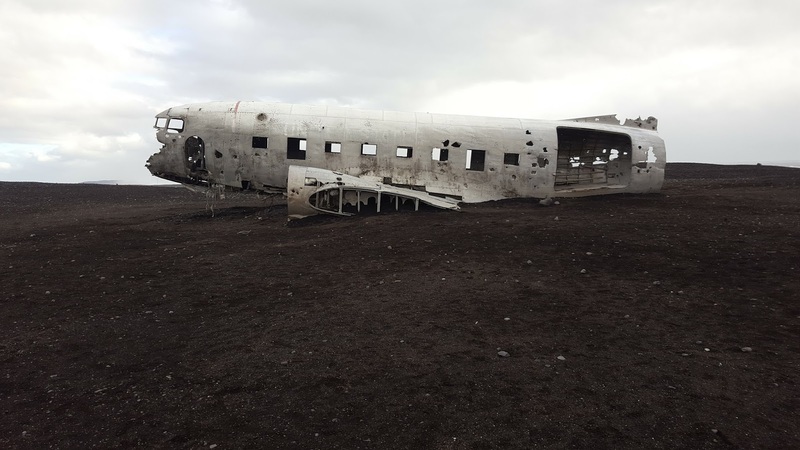 We landed at Keflakvi airport in the early hours of the morning, picked up our car hire and drove about an hour to Reykjavik. 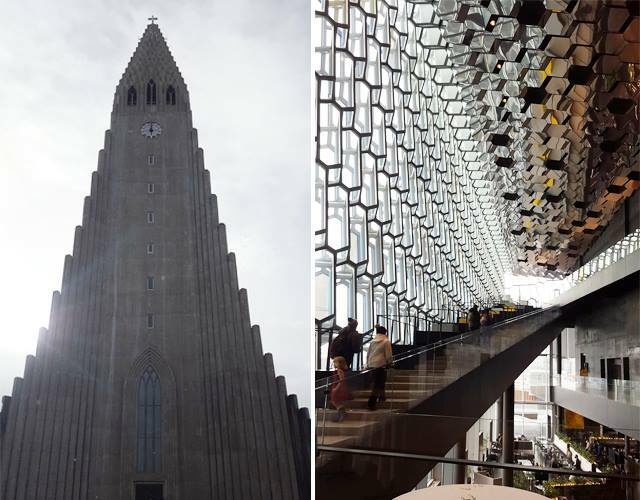 We drove straight to Hallgrimskirkja which actually has free parking, and we had a small wander round the cathedral. You can pay 900 ISK to go to the top, but as the weather was pretty crappy, we didn't see the point. Further sites in the city include Harpa concert hall, which was an impressive building but unless you see a show then there isn't much to see. Then we drove to the National Museum of Iceland, cost of 2000 ISK and yet again, not that impressive and not worth the cost in my opinion. And that was pretty much all we saw and did in Reykjavik. It was freezing when we landed and the weather was horrible so we didn't really want to walk around and see much, but there really wasn't much to see. 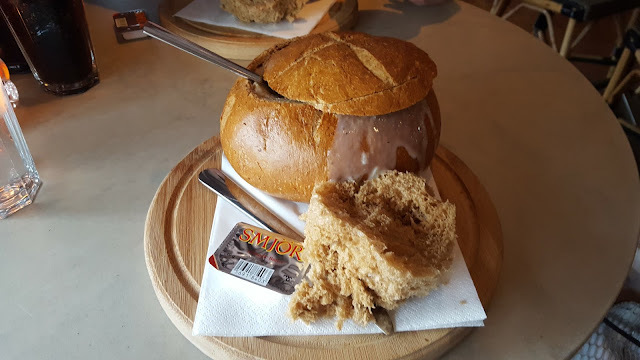 We went for a nice soup lunch at Svarta Kaffid, which has regular queues out of the door (mainly because it is one of the few restaurants in Iceland that travellers can afford) and that night we stayed in an Air BnB about 20 minutes drive from the city centre. 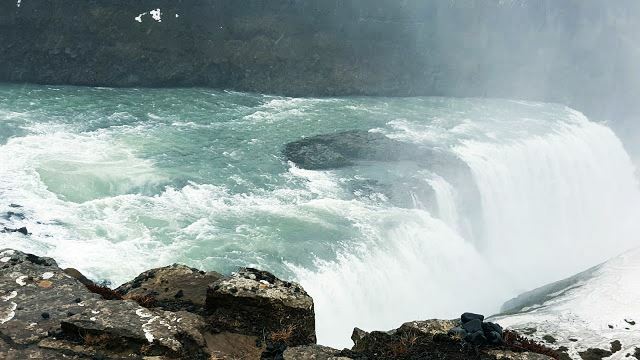 The typical route from the capital is to then drive the 'Golden Circle' which is all about 1-2 hours from the capital. 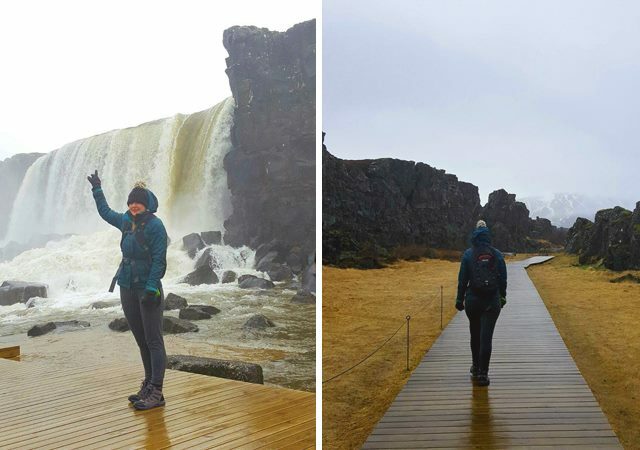 We started off with Thingvellir national park, about an hours drive from Reykjavik, and one of my favourite places in Iceland. Not too sure what was impressive about it but a large national park with plenty of different walks to enjoy the country's nature and a fair few mini waterfalls on the walk. You may a few hundred ISK to park and then about 100 ISK if you want to use the toilets but that's it. A further 40 minutes away is Strokkur (Geyser) and Gullfoss Falls which both should be on anyone's Iceland To Do List. 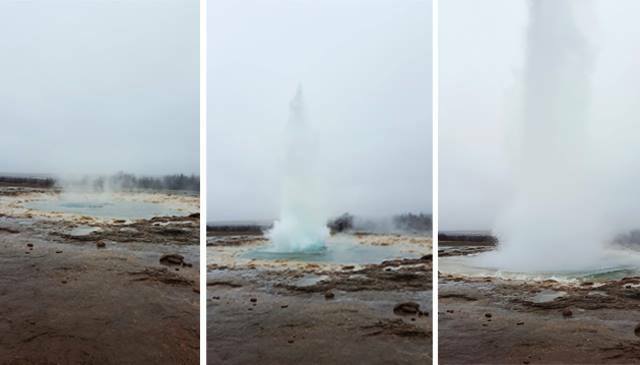 The Strokkur geysers are a few impressive geysers that erupt every 15 minutes so no need to time your visit. Complete with a visitors centre but overall a sight which can be covered in 30 minutes. 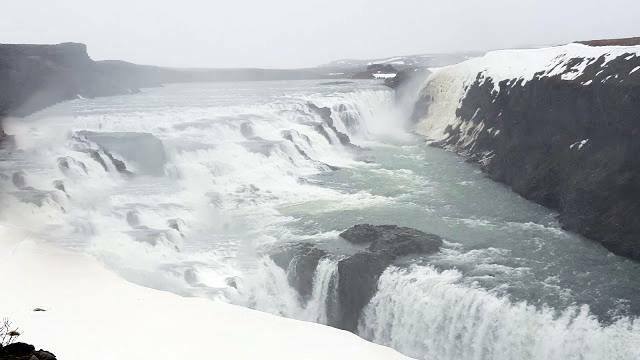 From there drive to Gullfoss falls (only about 20 minutes away) which host some very impressive waterfalls. Two sights that you don't want to miss. From there, we drove an hour to Fludir, which apparently is a popular holiday destination for Icelanders in the summer. We stayed in a nice Air BnB and went to the incredible 'secret lagoon' Gamla Laugin. 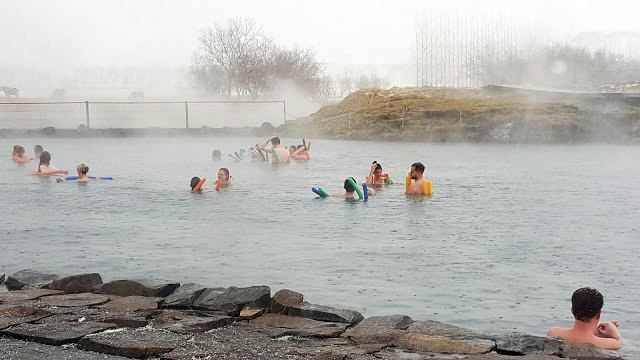 A natural lagoon, unlike the Blue Lagoon, and a perfect spot to relax in for a few hours especially on such a cold day. The weather dramatically changed when we woke up and I got to enjoy the views of beautiful mountains with my cornflakes. 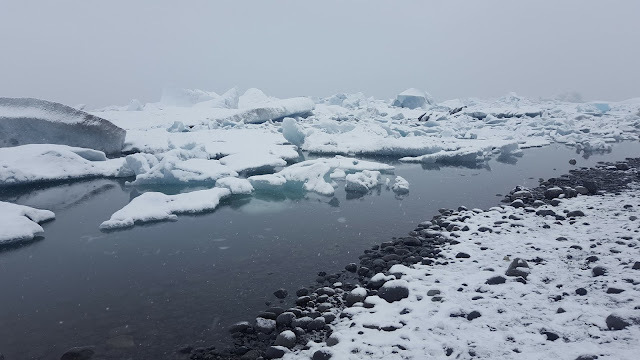 Yet the previous day, we couldn't see 10 metres in front of us. It just shows how dramatic the weather can be and can change in Iceland. Day 3 was met with plenty to do as the weather was so great. 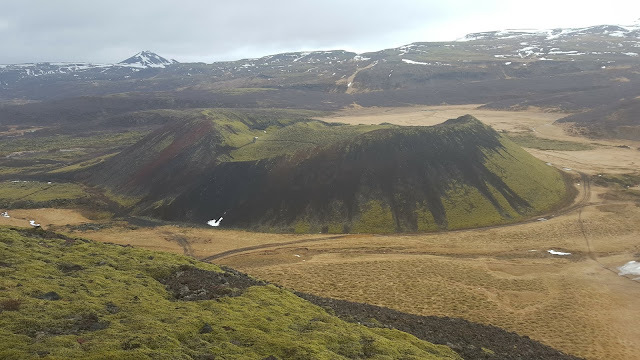 We started off driving just under an hour to Grímsnes, which is a volcano crater. Wasn't too impressed at the 500 ISK entrance fee, considering there wasn't anything to maintain or actually pay for, but the sight was impressive. A walk around the top of the crater and then a stairwell down to the bottom. From there we drove to Selfoss, which is a 'biggish' town in the south. 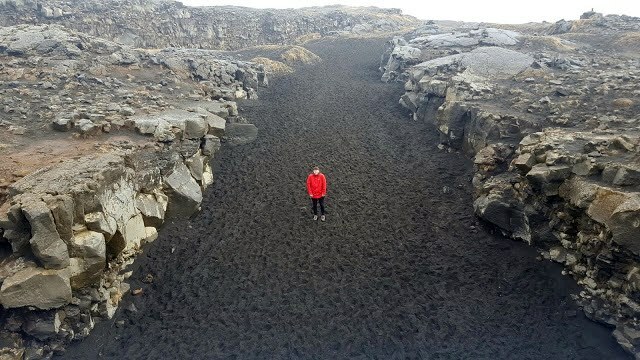 'Biggish' is an over exaggeration as no towns in Iceland are big. We stopped just for lunch at Yellowcafe which was a reasonable price and delicious food. 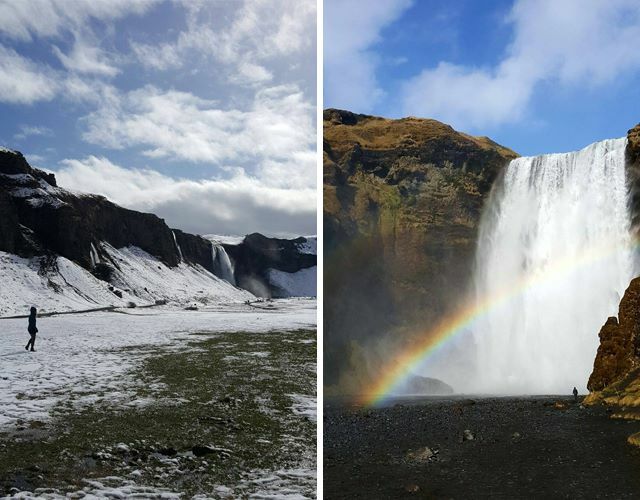 From we headed onto highway 1 and enjoyed the waterfall sites of Seljalandsfoss and Skógafoss. Both just off highway 1 and easily signposted so worth visiting. Day 4 was a day of terrible weather. We could barley see 10 metres in front of us to drive and it made the sightseeing for the day pretty crappy. 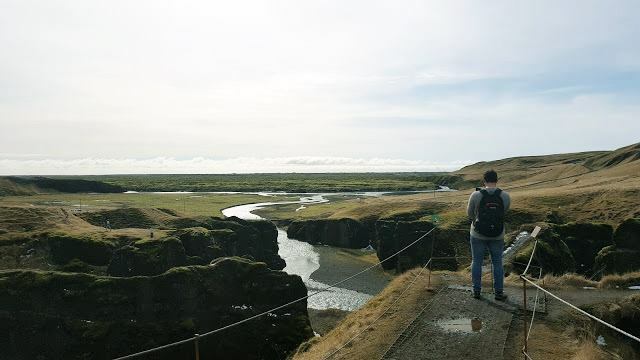 We attempted to go to Fjaðrárgljúfur canyon but after seeing a jeep stuck halfway up the hill and then after driving through several potholes, we decided to give up. 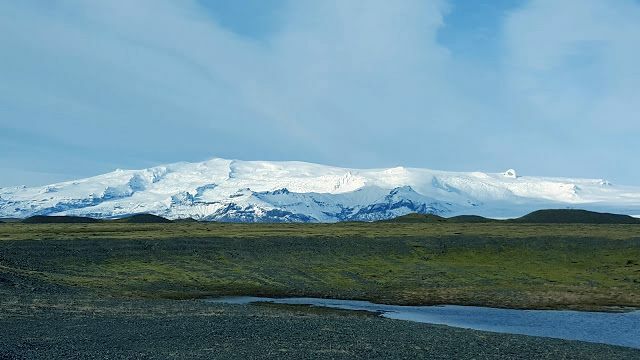 We then carried along highway 1 to Skaftafell national park which I really enjoyed! A fair few good hikes around but nothing too strenuous and I believe there is even an ice cave as well where you can go some ice climbing but we skipped that. Further on highway 1 is Jokulsarlon lagoon, which is basically a lagoon of icebergs. 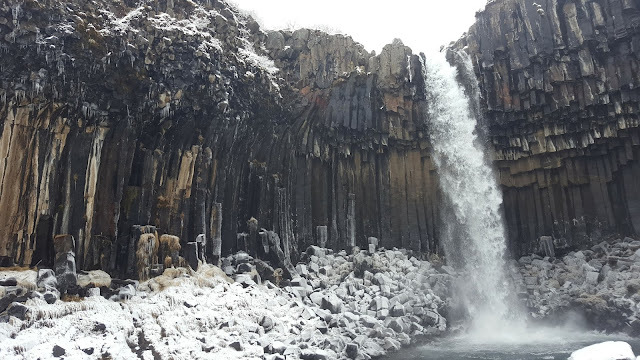 A very impressive sight, even when the snow and weather was really bad. Free to see everything and a little cafe at the sight, which was expensive and nothing too impressive. That night we stayed at Guesthouse Skálafell from booking.com. A nice guesthouse with breakfast included. No restaurants nearby so the guesthouse offered dinner at about £40 each. Day 5 - hello sunshine! What a difference the weather made to this day! We pretty got as far along as highway 1 that we thought possible as we had to pretty much return on the same route to head back to the airport. At first glance, this seemed pointless and almost a waste but as the weather was so bad on day 4, I was thrilled that we had a 'second chance' to see any sights that we had previously missed. 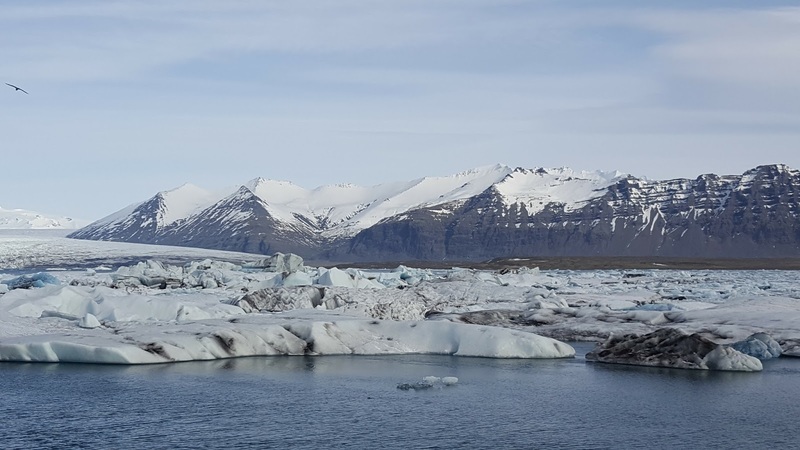 Day 5 was glorious weather and we headed back on highway 1, firstly passing Jokulsarlon lagoon again, which looked completely different in the sun. 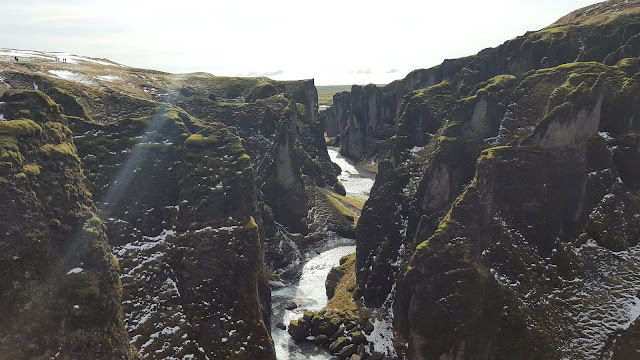 Then we parked our car at the bottom of the road towards Fjaðrárgljúfur canyon, and walked just off the main highway to the canyon which only took about 20 minutes. Fjaðrárgljúfur canyon was very impressive, and I highly recommend it. 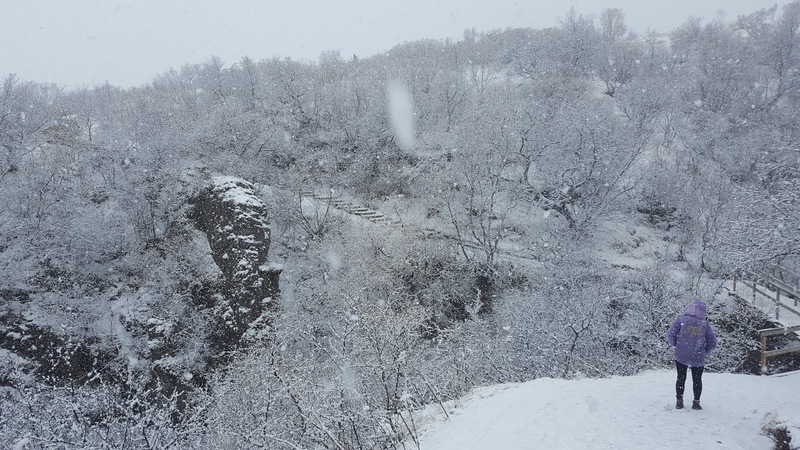 A chance to walk to the top of the canyon and see some beautiful waterfalls and a really fantastic view. A nice place for a little picnic as the sun was out. 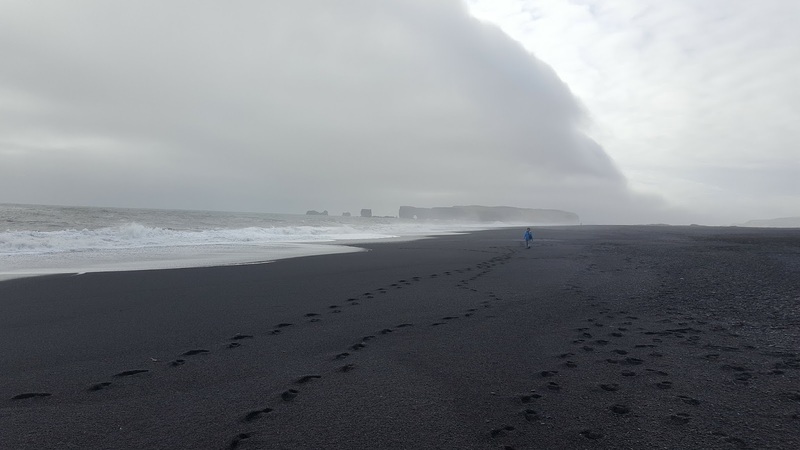 Then back we went along highway 1 to Reynisfjara beach (the black beach). Very similar to the Giant's Causeway in terms of rock structure (although some geologists may argue otherwise?) Worth visiting and only a 5 minute drive off highway 1. A nice cafe there and a lot of guesthouses on the road down. Then a long drive back to Selfoss and stayed in a nice Air Bnb. Day 6 - now what? 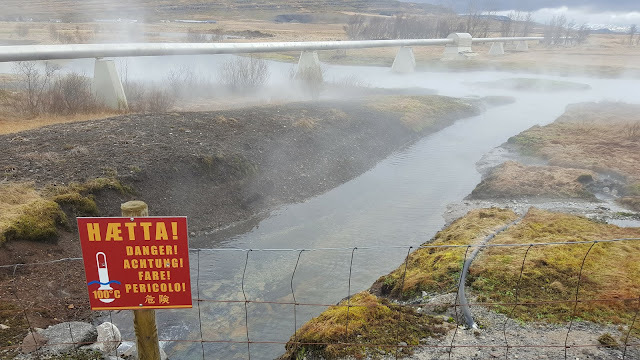 I found a hot spring online (Deildartunguhver) but when driving about 2 hours to get there, it really is just a few spurting hot pools (although a resort is opening up later this year I believe.) We then drove to Grábrók which was a few volcanoes. Very pretty and a quaint walk around but not worth the overall 6 hour round trip from Selfoss, and very back to Reykjavik. 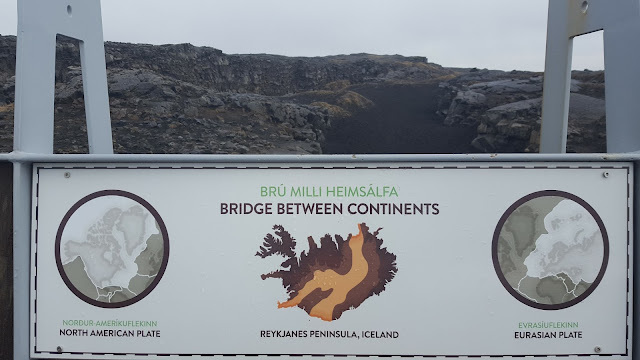 So, we passed our time going to the bridge between two continents in Sandvík which was actually pretty interesting but not worth going out of your way for if you're not in the area. Overall, just a bridge but between two continental tectonic plates, and it moves gradually each year, but only really by a tiny amount I believe. We then headed to Keflakvi and stayed the night in a lovely guesthouse, Svitan Guesthouse & Apartments, which came with a free breakfast. And that is all my friends, we got an early flight back the next day and that was our road trip to Iceland. A difficult trip due to the weather. The roads didn't seem safe in our crappy little Kia, so days spent mainly driving were hard and exhausting. And even at first glance of having to do a road trip then pretty much turning back on ourselves and doing the same road trip back, did seem pointless at first, but it proved useful as we missed a lot on certain days due to the weather, but got to see it again on our return journey. We probably could have drove a bit further east due to having a fair bit of time left on the last two days, but we didn't know it if was worth the effort and risk of icy roads. A beautiful country, but a damn expensive one, and not one to travel round in a tiny little car in the snow.